I don't want you to think that I always choose a pattern, pull fabric, and 3 days later have a quilt top assembled and the quilting started. I guess it's just the season (you know ---- NOT winter!) that makes me feel like getting something done. 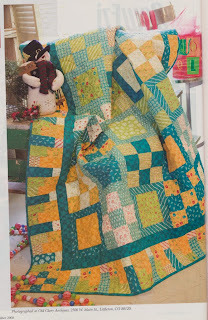 The pattern I decided to use for the baby quilt is called Santa's Toy Shop and was featured in the December 2008 issue of McCall's Quilting Magazine. .........but what I really want you to see is the backing fabric. 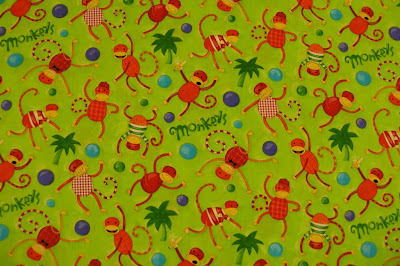 I had been told that the baby's room has a lot of lime green in it, and that the finials on the curtain rods are monkeys. I found this Robert Kaufman print called "Animals Gone Wild!" and it just begged to be taken home. Now, how could I resist such completely perfect fabric? 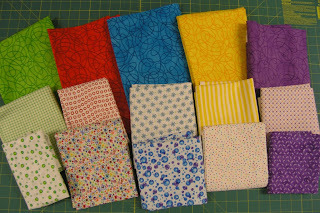 I have been to 5 quilt shops looking for coordinating fabrics. I had no idea it would be almost impossible to find simple designs in basic colors on a white background! I'm done shopping (after all, my stash can only grow so fast!) and have everything ready to cut. Take a look at the fabrics. 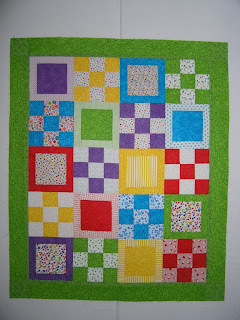 The next time you see them, they will be in the form of an adorable quilt top. I cannot even begin to describe how I have agonized over starting this blog. 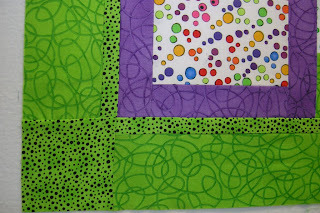 A lot of my quilty friends are blogging these days and I love following what they are doing, so I thought I would give it a whirl. I have so many interests to chat about and photos to share, and of course, I could talk about my family all day long. So maybe you will find something interesting here -- or informative, maybe even entertaining. I hope so.